More info:Includes transfers from Dubrovnik, Tivat or Podgorica Airports. Offers:15% off our Montenegro Gulet cruises from June - October. Cruise around Kotor Bay im a beautiful traditional wooden gulet. Sail power has very obvious benefits and we hope to sail under sail power up to 50% of the time, though this obviously depends on the prevailing weather conditions. By using a small vessel that can access the smallest ports, in addition to using sail power whenever practical, we restrict our travel to just a few miles per day, unlike larger vessels that have to travel a great deal further between ports. The small size of these cruise vessels and the small passenger numbers ensures that any detrimental social and environmental impacts are minimised whilst allowing the passengers to visit smaller communities that don’t usually benefit from this form of tourism. This also enables small communities to host tourists without the need for building hotels and other infrastructure that may be required. All our waste is returned to port and disposed of responsibly as we know that the beauty of the environment we work and live in provides us with our income. If we spoil our environment our livelihood would be in jeopardy. All the food on board is bought locally; fruit, vegetables, plenty of fish, shellfish and other seafood, meat and other staples are all locally grown and produced, and much of it is bought from small retailers or even directly from the grower or fisherman. This has a threefold benefit of reducing food miles, supporting local communities and providing our customers with very fresh food. Although only a small vessel we provide full time employment for 4 staff on board, plus a bike guide. 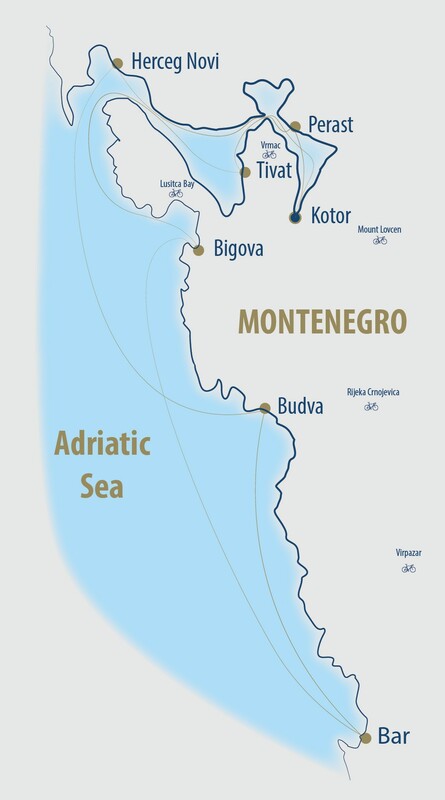 All our crew are Montenegrin and know the area where we cruise and ride. In addition by visiting small ports and harbours, and encouraging our guests to eat ashore on most evenings we are supporting local businesses as well as farmers and fishermen, as most of the produce in the restaurants is grown locally. Our chef on board uses almost entirely fresh local produce, which, apart from providing our guests with healthy and very tasty food, supports local farmers and fishermen in their traditional methods. We encourage our passengers to learn a few words (or more) of the local language so they can communicate a little with anyone they meet. We also encourage them to try some fresh produce rather than well known huge international brands. The vessels managers support the Montenegro Red Cross, specifically in their efforts to improve the quality of life and reduce the poverty of the elderly in Montenegro. This is aimed at people 65 or over who are not covered by other forms of assistance; elderly people who are in poor health; elderly people in a state of social need; older people living alone or with someone in need.